London: European shares steadied on Tuesday as a major index held above a key technical level, following sharp falls on Monday after an agreement on stricter budget rules at last week’s EU summit failed to ease worries about the region’s debt crisis. A slide below a moving average suggests an index will likely move lower, while a cross above a moving average suggests prices may be about to rise. “It is providing some support and could be the level to get in and trade. The index has been trading in a tight range and yesterday’s sell-off was overdone," said Bill McNamara, technical analyst at Charles Stanley. By 03:22 pm, the pan-European FTSEurofirst 300 index of top shares was up 0.3% at 969.73 points after posting its biggest fall in three weeks on Monday. The index was trading between its 38.2% Fibonacci retracement level from its September low to October high at 961.45 points to its 23.6% retracement at 987.07 points. 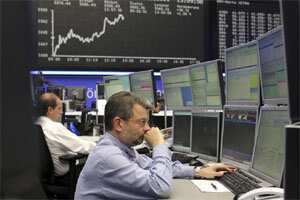 Traders said any gains would be short-lived, with the outlook for the euro zone grim. “Yesterday’s move takes us to a level a little bit more realistic and we might just see the market bounce a little bit," Giles Watts, head of equities at City Index, said. “But I would not read too much in it. There is still nervousness in the market, and unless the move up is backed up with something concrete, investors are likely to take profits later in the day." Investor sentiment dipped in the banking sector after Moody’s Investors Service said late on Monday it would review its ratings for all EU member states in the first quarter of 2012 and may also cut the ratings of eight Spanish banks. Banks, at the centre of the crisis with their exposure to euro zone sovereign debt, were the worst performers. The STOXX Europe 600 Banks index was down 0.9%. Commerzbank was the hardest hit, falling 4.5% after sources told Reuters the German lender had been in talks with the government over possible state aid.